Name: Robert Arthur Brett, Jr. Source: Compiled by Homecoming II Project 01 April 1991 from one or more of the following: raw data from U.S. Government agency sources, correspondence with POW/MIA families, published sources, interviews. Updated by the P.O.W. NETWORK 2002. Yen Bai. At 1:15 a.m., September 29, when the aircraft failed to return from their mission, the two were declared missing at the time of estimated fuel exhaustion. had no idea why the planes were lost because they fly singly and out of radio contact. Capt. Sponeyberger and 1Lt. Wilson had ruled out mechanical problems. "It seems logical that we were hit by small arms," Wilson said, "By what you would classify as a 'Golden BB' - just a lucky shot." out of the air by an ordinary bullet from a hand-held rifle or machine gun is a David and Goliath-type story the Vietnamese must love to tell and retell. Goliath story for Vietnamese propaganda. The F111 missions were hazardous and the pilots who flew them brave and skilled. Fourteen Americans remain missing from F111 aircrafts downed in Southeast Asia. If any of them are among those said to be still missing, what must they be thinking of us? AMERICANS ACCOUNTED FOR: According to the Department of Defense, there are now 1,936 Americans still missing and unaccounted for from the Vietnam War. Most recently, remains jointly recovered in June, 1994, were identified as Air Force Colonels Peter M. Cleary of CT and Leonardo C. Leonor of NY, both listed as MIA October 10, 1972 in North Vietnam. Also recently identified were Army SSGs Larry G. Kier of NB and Rufugio T. Teran of MI, missing in a South Vietnam ground incident since May 6, 1970. Local villagers initially provided remains in August 1992; joint operations resulted in further information and remains. 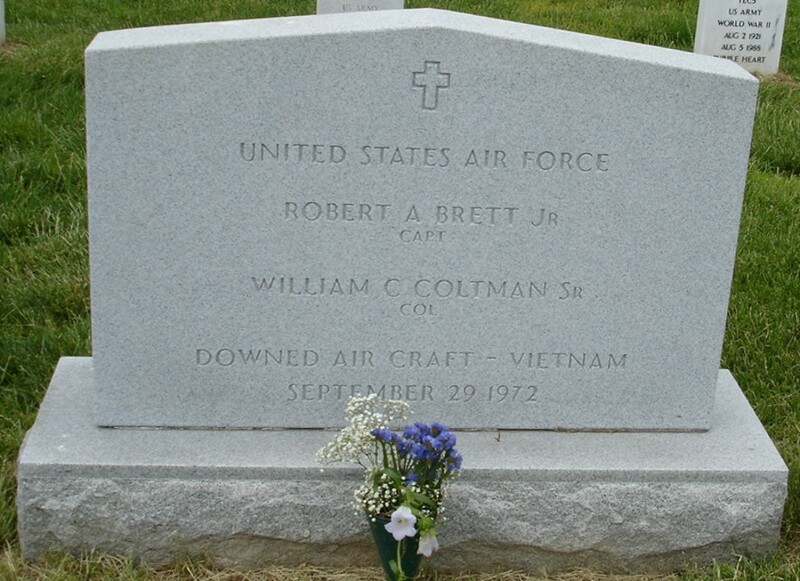 Others recently accounted for include Air Force Colonel William C. Coltman of PA and Lieutenant Robert A. Brett, Jr., of Oregon, missing in Laos since September 29, 1972, with remains jointly recovered August 28, 2000.
father. Brett had two brothers, Joe and Michael, and two sisters, Cindy Gulledge and Melissa Coven. thunderstorms when it lost radar contact.